The Conflicting People in Yemen have no Shame!! The conflicting people in Yemen celebrated on 30/11/2018 the 51st anniversary of the departure of the last British soldier from southern Yemen on 30/11/1967. Thus, the people of Yemen were deceived by the departure of British colonialism, and the fact is that British colonialism has nominally left, but has remained actually. When the colonist left militarily, he left behind him an army of political, military, tribal chiefs, political parties, businessmen and other agents and has chosen by himself who to hand over power in Aden through the Geneva negotiations on 20-28/11/1967 to be servants and slaves to him. Britain’s political work in Yemen has continued for the past 51 years and has made an unrivaled political influence in Yemen, despite continued American attempts to oust it and replace it, or even to share the influence and wealth with Britain by supporting the Houthis and the southern separatist movement through Iran. America has thus created influence in Yemen to rival British agents, which has brought Yemen into a dirty colonial war between the two criminal states America and Britain and their local and regional agents, and the war is raging for almost four years and no solution looms on the horizon. The affair of these conflicting agents is strange; which independence are they talking about, when America and Britain are the controllers in the country who decide to declare the war and stop it in the daytime, do they not make sense?! Rather, which independence are they talking about, as Yemen has become a field for every conflict, and its wealth a loot for every greedy, while its seas and skies have become a hotbed for warships, Western fleets and American drones that kill whoever they want and whenever they want without deterrence. 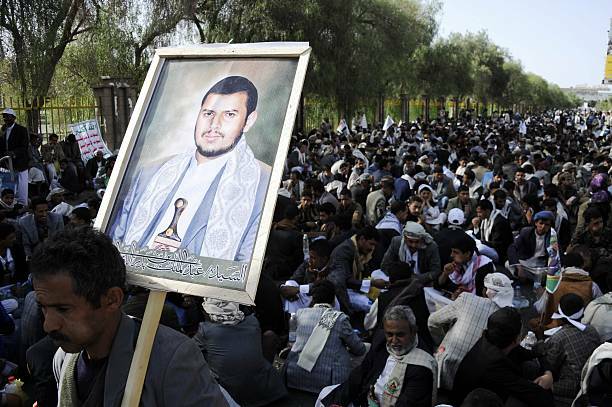 In addition to what the puppet tools such as Saudi Arabia and the UAE do to dominate Yemen for the benefit of America and Britain and the frantic rivalry for the resources of the country of Iman and wisdom, followed by Iran, which declares the support of the Houthis and spreads sectarianism through them with insolence?! As-Sadiq (the truthful) and Al-Amin (the faithful) ﷺ said: «إِذَا لَمْ تَسْتَحْيِ فَاصْنَعْ مَا شِئْتَ» “If you have no shame, do as you wish”. The conflicting puppets submit their leadership with servility and subserviently to the criminal United Nations to solve their problem, while it is a tool of the colonists. And here is the American ambassador visits Hadramout as if he is the actual ruler of the country, where he hands over the Yemeni coasts, as he said from the coalition to the Yemeni Coast Guard forces and entrusted them with the task of combating (terrorism) in service to America, the head of terrorism, which we did not see any of its military forces which fill the land and the sea, being targeted by those screaming death to it, instead they are coordinating with it! These conflicting agents celebrate the anniversary of the evacuation of the colonist, while they are under his attendance and under his soles. He orders them and they obey. They agree to his administration of the port of Hodeidah and the return of the colonial International Bank and the International Monetary Fund (IMF) to manage and dominate the country’s economy. However, we do not hear anyone shouting against that, instead we see them all agree, no matter how much they intensify their false scream and empty blustering! O celebrants in Yemen! Know that colonial systems, programs and culture are still applied in our country, and these conflicting ones are only mercenary guards who carry out what the colonists want on the people of Yemen through ‘iron and fire’ and with the support of their evil masters. So, will you wake up O people of Iman and wisdom from your inattention and work for the real liberation that satisfies your Lord and cuts off the colonial disbelievers from your country and the Muslim countries, and uproot all what is related to them of agents, subversive systems, programs, colonial institutions and malicious organizations? Unquestionably, the way to this is to work to restore the rule of Islam to the reality of life, so responded to the call of Hizb ut Tahrir to establish the Khilafah Rashidah (righteous Caliphate) state on the method of the Prophethood, by which Islam returns impregnable and honored. For this let the competitors compete. Next PostDays after their Oath on the Qur’an Members of the Government Wage War on Islam by Changing the Provisions of Allah!